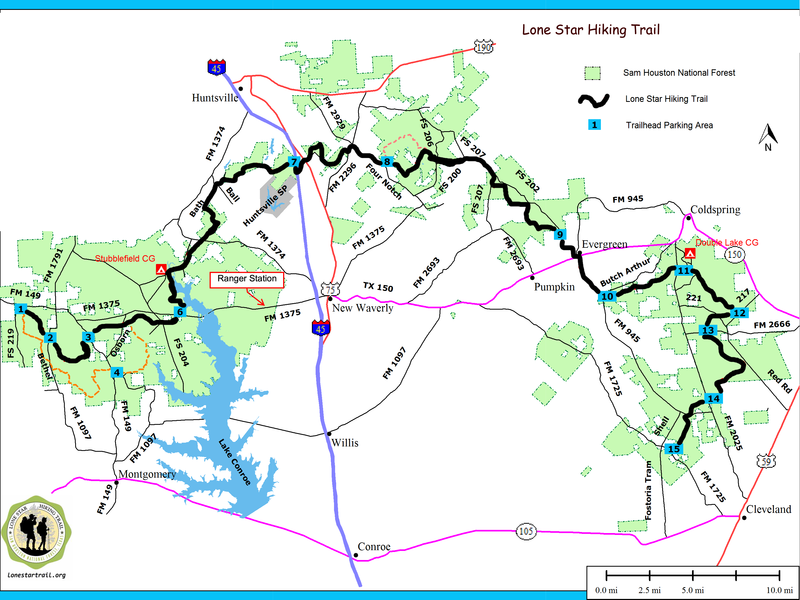 The Lone Star Hiking Trail is the longest hiking trail in Texas. This 129-mile (including loop trails) National Recreation Trail winds its way through the beautiful Sam Houston National Forest. 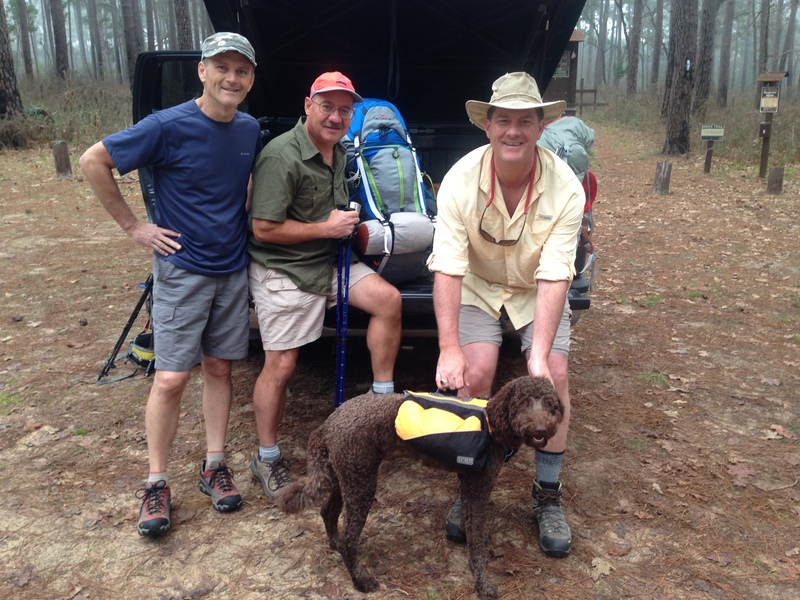 Last year, a couple of my buddies and I thru-hiked the main 96-mile trail from Richards, Texas all the way to the eastern terminus near Cleveland. 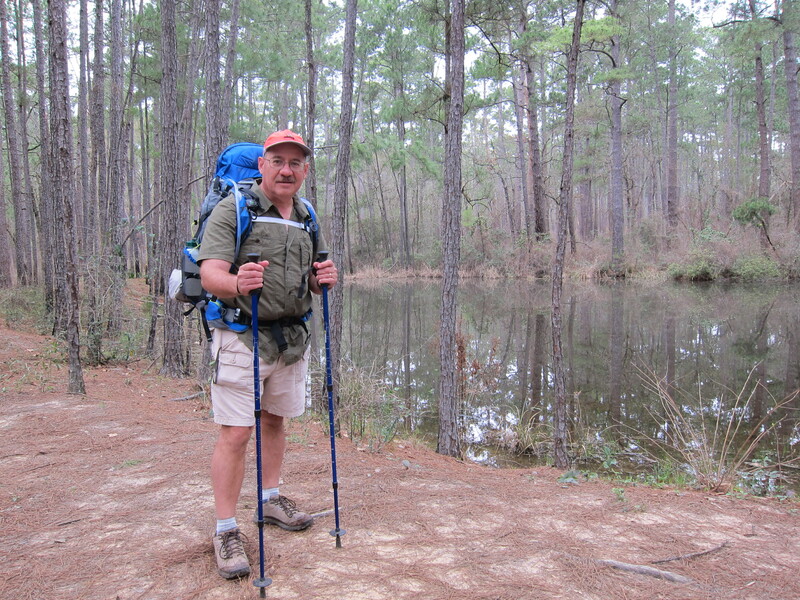 The Lone Star Hiking Trail is indeed a Texas treasure — a heaven for hikers. Over the seven days on the trail we hiked through some of the most absolutely beautiful scenery I have ever seen. Tall pines and majestic oaks accented by blooming dogwood trees. Colorful wildflowers splashed on the pine-needle carpeted trail. Every step of the way held interesting sights. And there is no way to describe the gentle sounds made by the wind plucking notes on tree branches. Although the terrain is relatively flat, in some sections the trail meanders up and down through miles of forests of pine, oak, and mixed hardwoods. In places, the trail follows winding bayous for miles, often bisected by these natural waterways. Footbridges make it easier to cross boggy sections or deep ravines. And, there are many places where the trail gently slopes upwards for such long distances that you feel the burn in your legs. Doing this thru-hike does require a few miles of hiking along Farm to Market and Forest Service roads. This is where we encountered so many dogs along the way. Private homes along these country roads, it seems, had their fair share of dogs that sensed our approach and barked smack in an effort to scare us away. 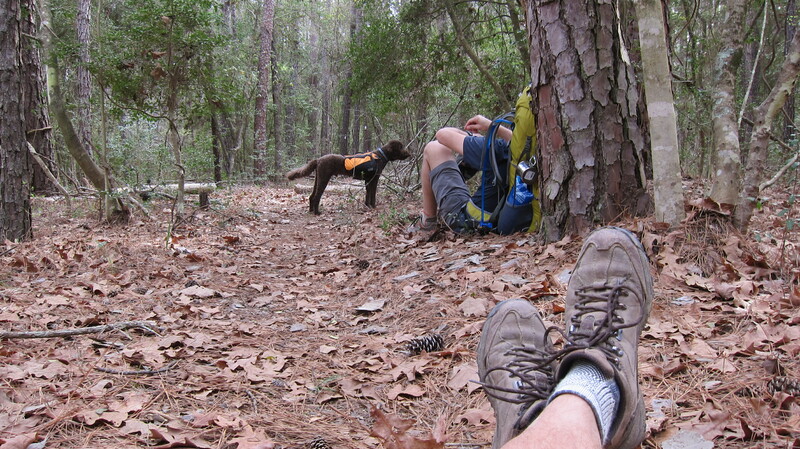 Hiking the trail means factoring in times of rest along the way. These rest times were opportunities for us to sit silently in the woods, allowing us to look up at the sky through the tall pines. 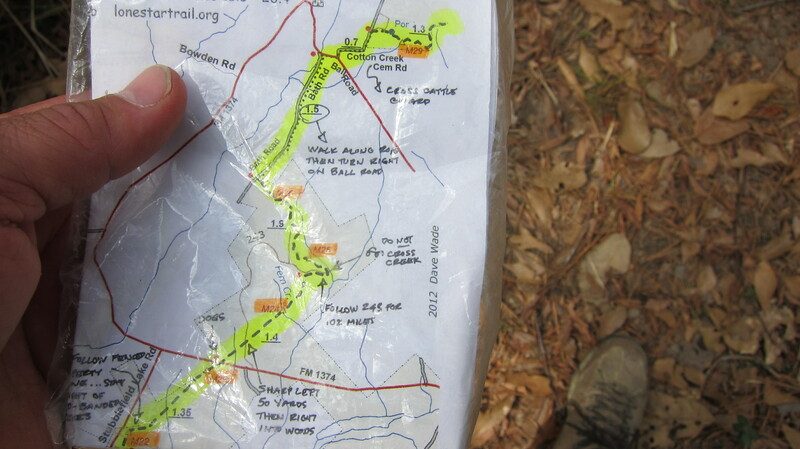 We also took advantage of these quiet moments to do a little foot care, to down some extra nutrition, and to study our maps. Every segment of the trail presented its respective challenges — an incline, crossing a ravine, dense and low-hanging overgrowth, mud, pounding pavement between trailheads, finding a water source or campsite. Each challenge made our trek all the more adventurous. For several days, the one nagging thought in the back of my mind was how we would cross the East fork of the San Jacinto River. Not knowing how much water was in the river or whether an old log reported by other hikers was still the best way to cross the river made me anxious to get there. Worst case scenario would mean backtracking and taking a long detour. 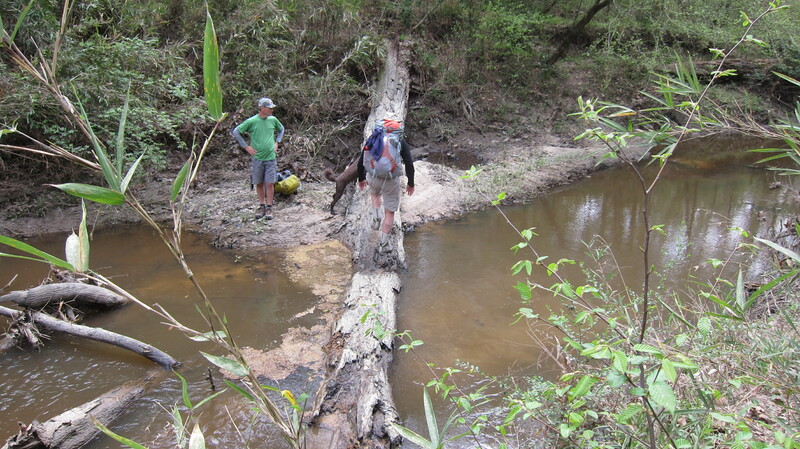 Fortunately, we were able to cross the river by walking across the old partially submerged log. We found great places to camp along the way, filtered our water, prepared meals on our backpacking stoves, and enjoyed sitting around our campfire in the evenings. When we passed through Huntsville State Park we enjoyed refreshing showers and bought lots of snacks at the park store. Near the end of our hike it rained and rained, so we cut our adventure short by one day and hiked the final 21-miles in the pouring rain. Hiking the Lone Star Hiking Trail was an unforgettable experience. This trail is indeed a hiker’s heaven. Regardless of whether you only have time for a day hike, an overnight camping trip, or a long-distance trek, you will absolutely love this trail. The trail is very well maintained and the route clearly marked with blazes on the trees. 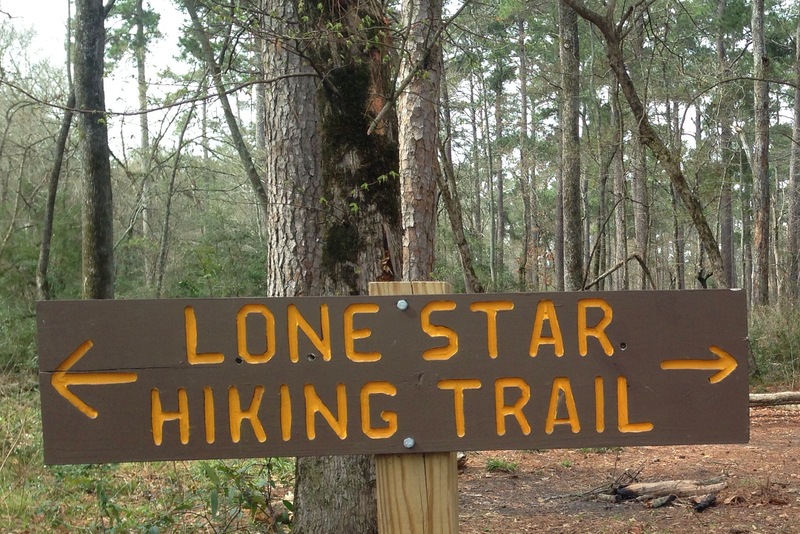 If you are a hiker, consider planning an adventure on the Lone Star Hiking Trail. And if you camp out, you’ll find that the stars at night are indeed big and bright, deep in the heart of Texas. This entry was posted in Hiking and Camping and tagged Backpacking, Hiking, Lone Star Hiking Trail, National Recreation Trail. Bookmark the permalink.